Cart and Crate Combo, better together at only $109.99. Perfectly fitted to the UpCart, the Fold-A-Crate is the perfect accessory! The UpCart Deluxe and 2 UpCart Fold-A-Crate - the perfect match for each other! Our most popular UpCart with two multifunctional, collapsable storage crates ideal for everything from holding shopping bags in the trunk to toting cleaning or art supplies! Save big by buying together! This stair climbing cart can go over almost any terrain! It's built to last and able to carry 125 lbs. with ease. Instructional tips about opening, closing and operating the UpCart Original & Deluxe hand carts. Love Your UpCart Deluxe? The Upgrade Bag is PERFECT for that extra help you may need lugging groceries from your car to your house! See how you can easily load objects much wider than the frame of the UpCart onto the platform. Every UpCart Deluxe includes the kinds of features to easily take you where you’re going. Take along your heaviest stuff, without the lifting. Change the height of the 3 positions handle to best suit you. The UpCart Deluxe conveniently folds flat for easy storage, keeping you ready for your next move. 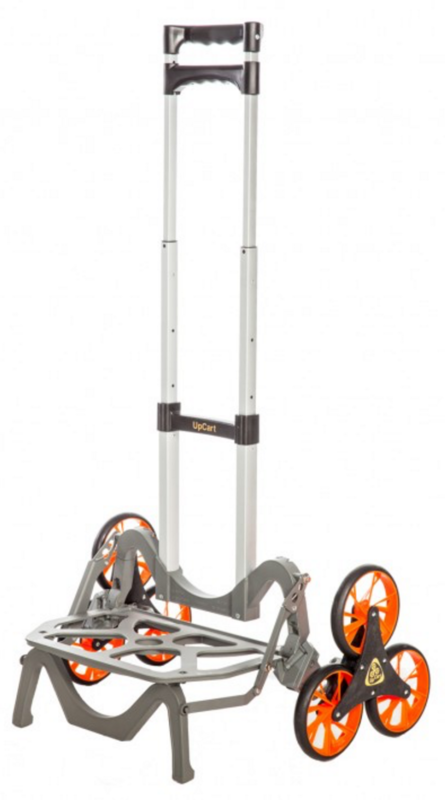 We've got the answers to help you stay moving with the UpCart Deluxe. What’s different & unique about the UpCart Deluxe? 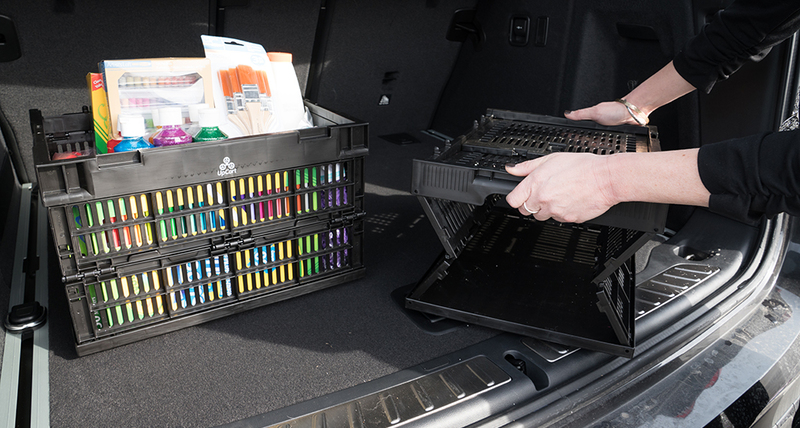 The UpCart® Deluxe is multipurpose workhorse that is great to keep around the house or in the car. Engineered to be an UpCart you can use everyday to reduce the effort of carrying items on stairs, over curbs and irregular terrain. It features a capacity of up to 125 lbs and only weighs only 10.6 lbs. The UpCart Deluxe decreases pressure applied on supporting surfaces, improves stability and is capable of “walking” over curbs, stairs and irregular terrain. It is very easy to use because you can adjust the handle to one of three different heights. Just set the handle to your preferred height to make it most comfortable for moving your items. It also will fold completely flat for easy storage and transport. This UpCart also comes with a free bungee cord included to safely secure your items. The UpCart Deluxe is a cart you would use everyday for anything from groceries to heavy toolboxes. As with all of our UpCart offerings, it comes fully assembled. What are the best uses for the UpCart Deluxe? Moving Document Boxes / Milk Crates / Product Samples, etc. Really it is up to you and your lifestyle for what you would use the UpCart Deluxe for as it is not limited to just moving one item. Ask yourself, how would you use the UpCart Deluxe? Chances are you will have a lot of answers to that question! What material is the UpCart Deluxe made from? What is the warranty for the UpCart Deluxe? The UpCart Deluxe was built to hold up to the rigors of daily use. We stand behind the quality of our products and are proud to offer a LIFETIME warranty on the UpCart Deluxe against any manufacturing defects! Warranty is valid for the original purchaser only and non-transferrable. Are there any accessories for this product? Yes there are accessories for the UpCart® Deluxe. The UpGrade Deluxe Bag is the perfect complement to the UpCart Deluxe. This bag is custom fitted for the UpCart Deluxe as a rugged, tote style, 12 gallon bag made from Cordura nylon (known for its durability and resistance to abrasions, tears and scuffs) and has a rip-stop nylon liner that expands the capacity of the bag to over 20 gallons! The multipurpose bag is easily attached with secure straps. The UpGrade Deluxe Bag can also be carried separately with removable straps. There is a cell phone pocket for convenience. The bag is yellow and orange. We also offer a second bag option called the UpCart Tote Bag. This bag is also custom fitted to the cart and attaches the same way as the UpGrade Bag. However this bag does not have the shoulder strap or expandable liner. If you are looking to secure your larger items safely on the UpCart Deluxe, look no further. We have great bungee cord and strap options. For a list of all accessories, just click on the Shop All page! Can you place wide objects on the UpCart Deluxe? Yes, the UpCart® Deluxe is able to handle items larger than its platform base. The UpCart Deluxe does feature brackets on either side of the platform that act as both a locking mechanism to keep the cart from folding during use and as wheel guards to prevent anything from interfering with the operation of the wheels. Simply place items that are larger than the base in front of the brackets/wheel guards, and tilt back against the frame or secure with a bungee. Your load will not interfere with the use of the wheels up and down steps and over irregular terrain. Please refer to the video on this page to see how it works! Is assembly required for the UpCart Deluxe? No way! As with all of our UpCarts, the UpCart® Deluxe comes fully assembled and ready to roll.